You will love this vegetable biryani which is fit to grace the banquets tables of the Mughal court. The good news is you can replicate it at home anytime by following the recipe. And who says food without meat is boring? This vegetable biryani is prepared with a plethora of spices and fresh ingredients which transforms the traditional elements to a culinary wonder. But don’t take my word for it. After all, – after all, tasting is believing! 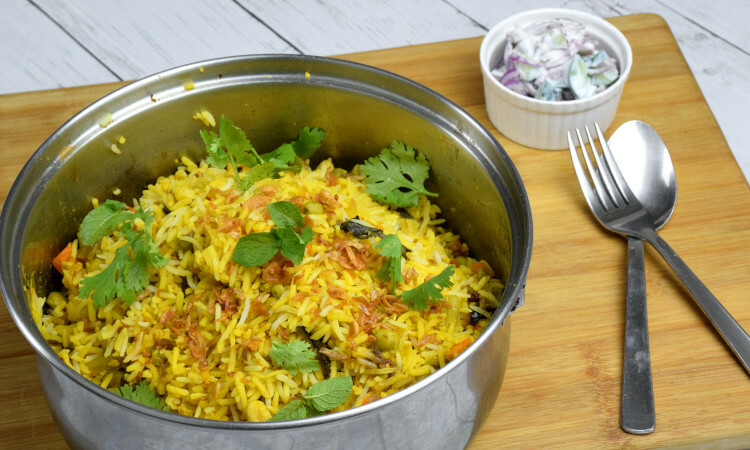 This vegetable biryani is developed in response to the request by some of my readers who read about the chicken biryani recipe which I posted in 2017, who ask me how to convert it to a vegetarian version. Without the meaty flavor of chicken, this recipe relies on the combination of herbs and spices, as well as a variety of vegetables complement each other to create the bold and flavorful taste that stands out on its own, not as the sidekick of the more heavily flavored counterpart. First, partially cook the rice in boiling water, just like cooking the chicken biryani. Then, cook the vegetables with the herb and other warm spices. Lastly, layer the rice on the vegetable and cooked with the dum method. If you have tried other biryani recipes, this is very much of swopping ingredients. However, I will go into detail of each step, just in case you might have missed out any points. Soak the basmati rice in water for at least half an hour. Then drained and set aside. This step is similar to how I prepare the chicken biryani, except this time I cook the soak and drained rice in the boiling water with some spices: cloves, cardamom, peppercorns, cinnamon, bay leaf, and star anise. The reason I want to flavor rice at this stage with the herbs and spices is that vegetable has a more subtle flavor relative to meat. Add some salt to the water, just like boiling pasta. The rice should boil over medium heat until it is about 3/4 cook. That is when the rice grain will break if you press it with two fingers. It will take about three minutes, depends on the volume and the heat. Once it is done, remove the rice and drain with a wire mesh strainer along with the spices. Set aside. 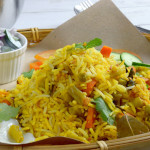 The spices used in the vegetable biryani are similar to the chicken biryani. The combination differs from one region to another. Since I am living in Malaysia, my recipes may have picked up some local influence, which means this will not be the truly authentic version form India. However, it will be close to the Hyderabadi biryani since there is a large number of people of Indian origin living here. 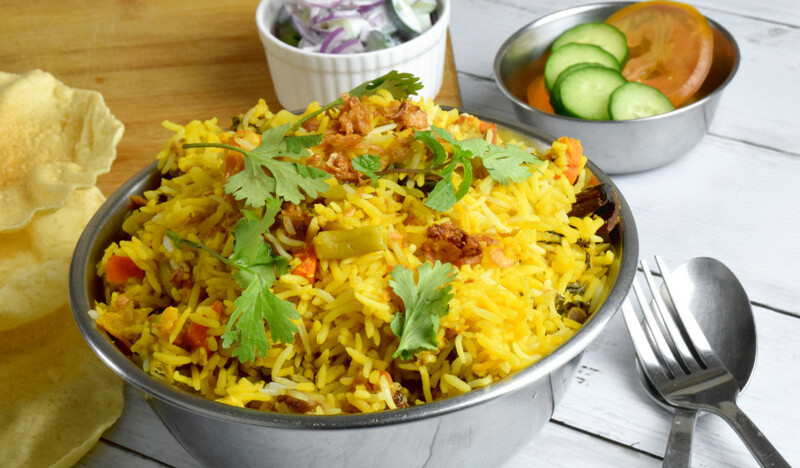 Instead of solely depends on a one main ingredients for flavor as of chicken or mutton biryani, vegetable biryani is made up with a list of vegetables. Carrot, cauliflower, French bean, green pea and tomato in this recipe. Other favorite vegetables are capsicum and potatoes. To begin with, melt the butter or ghee in a thick bottom pot or pan. Throw in the whole spices (bay leaf, cloves, cardamom, black peppercorn, and cinnamon bark. Saute it over low heat to let the flavor of the spices infused into the oil. I cut the tomato in small cubes, cauliflower into small florets, carrot and French bean into short strips. You may want to cut them into any shape you like, but it should be small so that it can cook through quickly. Next, add the remaining herbs, spices, and seasonings. (Ground coriander, ground turmeric, chili powder, and of course ginger and garlic paste, and salt to season. Add the yogurt and vegetable stock to cook the vegetable for five to ten minutes until they turn soft. Use water if you do not have vegetable stock, although it is not ideal. I am fortunate that there is always vegetable stock with me in our restaurant. I cook the vegetables in the same pot to cook the rice subsequently. Efficiency is always on top of my mind for any work in the kitchen. The final step to prepare the biryani rice is to layer the rice on top of the vegetable in a pot which can fit with a tight lid. 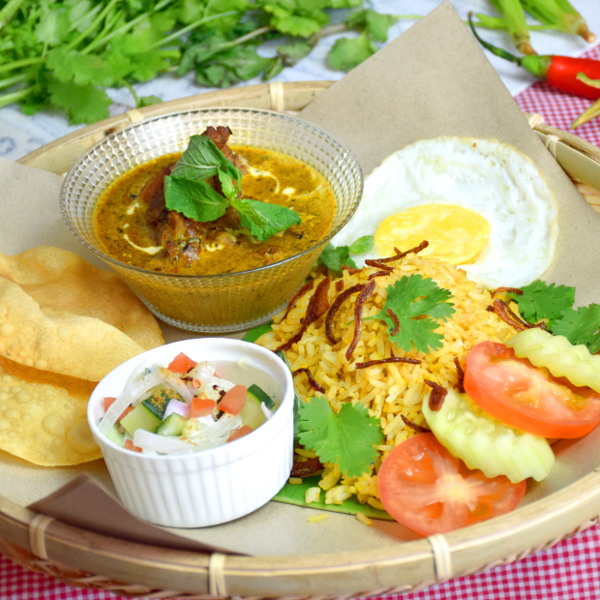 The biryani prepare this way is called dum biryani means cooking with its own steam. Spread the drained, half cooked basmati rice on top of the vegetables. Add some mint leaves, coriander leaves, and fried shallots. Cook the rice over very low heat. Add more fried onion, mint leaves and coriander leaves on top of the rice and cover with a tight lid. The lid should be tight, which enable the rice cook by the steam created by itself slowly. If it is not tight enough, get some bread dough or chapati dough to seal it up the edge of the pot. The goal is to prevent the steam from escaping and let the rice to cook by its own steam and juices slowly. High heat will cause the ingredients at the bottom burn quickly before the rice turns tender and soft. It will take any time between 30 minutes to 50 minutes, depends on the amount of rice and the heat. Once it is done, remove from the pot and mix the rice with the vegetables at the bottom carefully. The basmati rice is much longer and slimmer than the Thai fragrant rice and Japanese rice. It can easily break if you stir and flip it too much, The action should be gentle and slow. Once you scoop the rice onto the serving plate, garnish the rice with additional fried shallot, fresh mint leaves, and coriander leaves. 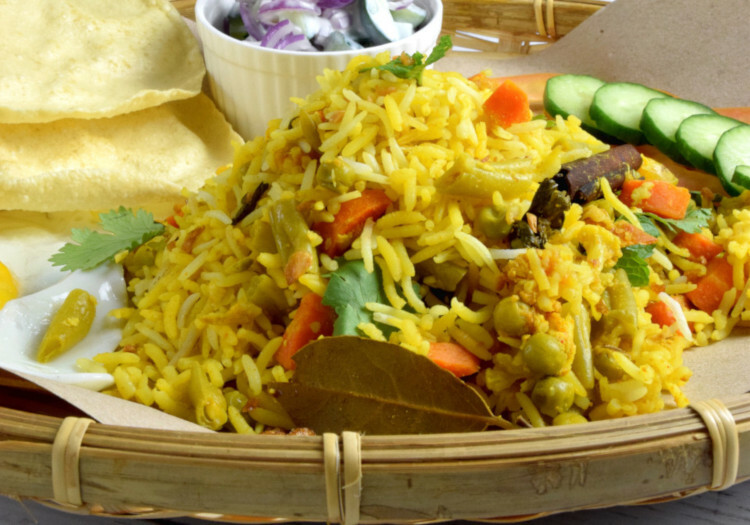 The vegetable biryani can be served alone or with curry. It is also a good idea to serve along with cucumber raita which is cooling as biryani is a bit spicy. Crush a piece of poppadom and mix with the rice is also a favorite way to enjoy the biryani by the local people. 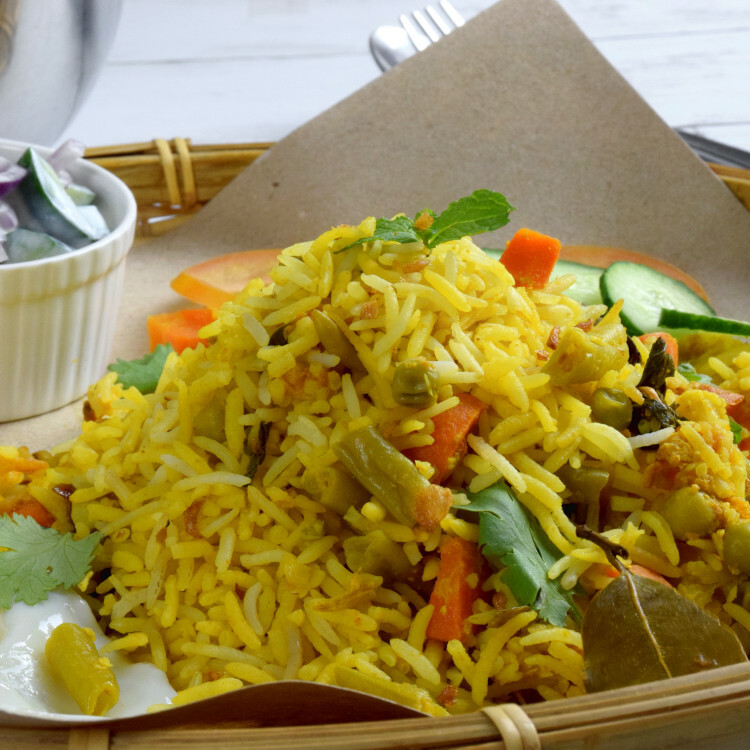 This vegetable biryani recipe relies on the combination of herbs and spices, as well as a variety of vegetables complement each other to create the bold and flavorful taste. Soak and boil the rice for at least half an hour. Soak the basmati rice in water for at least 30 minutes. Cook the rice with some salt and the herbs as in ingredient (A). It will take about three minutes, depends on the volume and the heat. Melt the butter or ghee in a thick bottom pot or pan. Throw in the whole spices (bay leaf, cloves, cardamom, black peppercorn, and cinnamon bark). Saute it over low heat to let the flavor of the spices infused into the oil. Add the tomato in small cubes, cauliflower in small florets, carrot and French bean in short strips. Add the remaining herbs, spices, and seasonings. (Ground coriander, ground turmeric, chili powder, and of course ginger and garlic paste, and salt to season. Add the yogurt and vegetable stock to cook the vegetable for five to ten minutes until they turn soft. Layer the rice on top of the vegetable in the pot. Add some mint leaves, coriander leaves, and fried shallots. Close tight. Cook the rice over very low heat for 35 minutes. Serve. 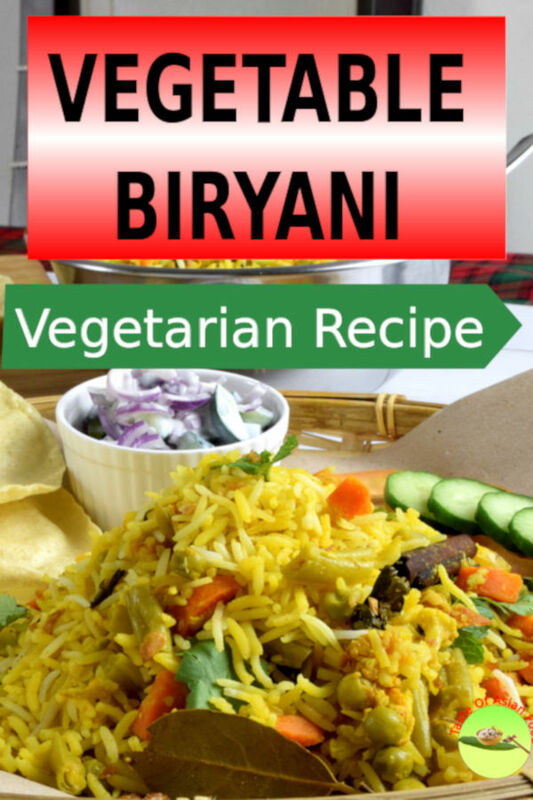 4 replies to "Vegetable Biryani – How to cook in three simple steps"
I totally enjoyed reading the recipie and watching your video. I cannot wait to have a chance to cook it. Or, to visit KL and your restaurant again. Special HI to your family! Thank you so much for following my recipe. Drop by whenever you are in KL.